I’ve never been much of a traditional pickle-maker but I do like the combination of sweet and sour, especially when vegetable flavors shine through. I have some favorite vinegar-accented recipes I turn to when there’s another pile of sweet summer onions, carrots, beets and fennel in the kitchen, but new recipes tempt me too. 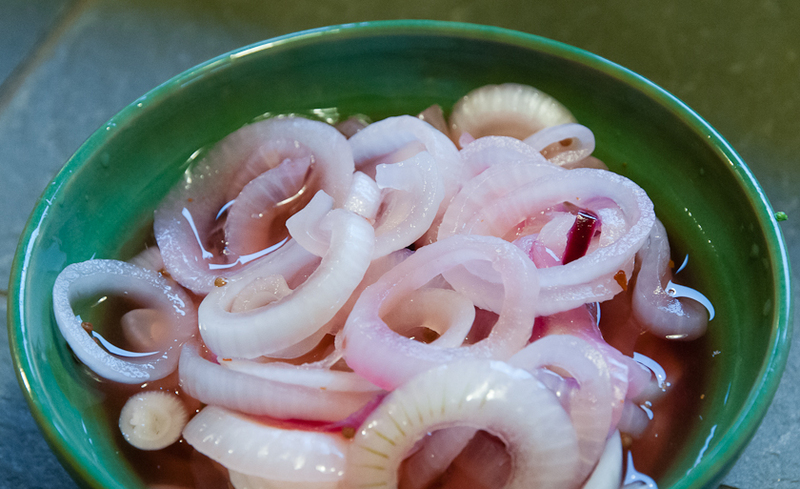 The lovely purplette mini-onions are perfect for pickling right now. Last year (https://lopezislandkitchengardens.wordpress.com/tag/purplette-mini-onions/) I roasted my entire purplette crop but this year I grew extra, planning to pickle a few. I made a batch the other day and they were great: milder than red onions and wonderfully crisp. There are many recipes for pickling onions but the one that I return to most often is in Annie Somerville’s Fields of Greens cookbook. Slice a pound of onions into quarter-inch rings, separate them, put them in a bowl, pour boiling water over them and let them sit for two to three minutes. Drain them, return them to the bowl and add three-quarters of a cup of vinegar, half a cup of cold water, a half-teaspoon of peppercorns or whole coriander seed and a half-teaspoon of hot pepper flakes. Somerville suggests rice wine vinegar but I’ve also used white wine and even cider vinegar with great results. I also add both peppercorns and whole coriander seeds and up to a tablespoon of sugar and a bit of salt. Chill them for an hour and they are ready to eat. They are a perfect condiment with just about anything. Beets are another vegetable that pickles beautifully and I’m always on the lookout for new ways of adding sour to their sweetness. What a treat to find my favorite New York Times food writer Melissa Clark’s recipe for pickled beet stems a few weeks ago: http://www.melissaclark.net/blog/2012/07/phat-beets.html. While the pealed, cubed beets are cooking she heats a pickling sauce of vinegar, sugar, garlic, coriander seed, lemon thyme, dill seed and black pepper until the sugar dissolved. 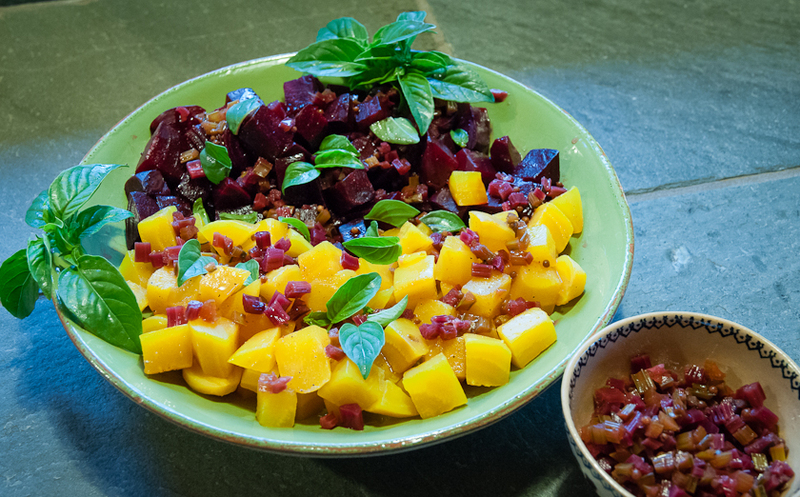 Then she pours this hot mixture over diced beet stems—“sparkling little rubies” she called them—lets them sit for an hour, then uses them as a dressing for the cooled, cooked beets. I made this recipe last week and will be making it again. It’s delicious. For adding sour to the sweetness of carrots, I turn often to an Italian recipe I’ve made for years, Carote in Scapece (sauteed carrots with vinegar and oregano), from Marcella Hazan’s Marcella’s Italian Kitchen (1986). Scapece, she explains, is “an Italianization of the Spanish escabeche. It is a manner of pickling vegetables or small fish by first frying them in olive oil, then steeping them in vinegar and mint.” This method is perfect for carrots with the olive oil bringing out a richer flavor than vinegar alone would do and oregano and red pepper providing a nice alternative to mint. Slice two pounds of carrots into quarter-inch slices and boil them briefly, until they are still more crunchy than tender, then drain them. In a skillet that will hold all the carrot slices, heat three tablespoons of olive oil, add three or four peeled, sliced garlic cloves and fry for a few minutes. Hazan recommends removing the garlic at this point but I always leave it in and let it pickle along with the carrots. 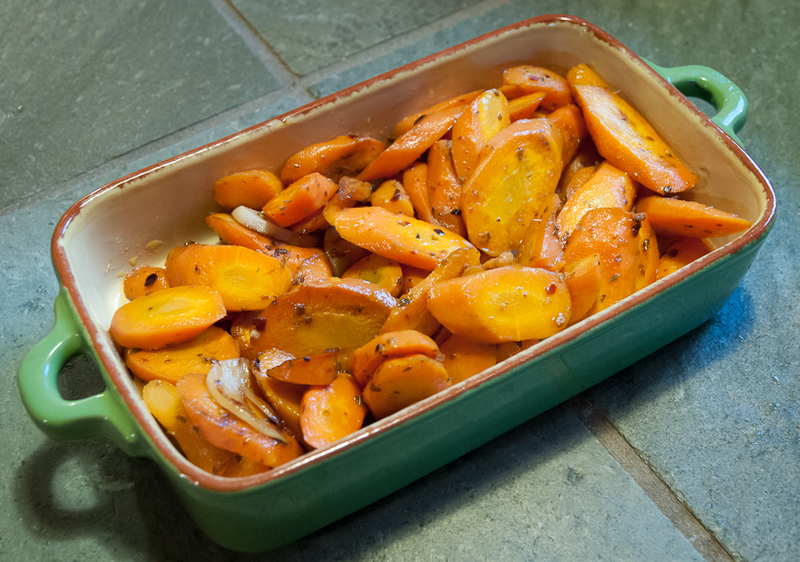 Add the carrots to the skillet and cook for a minute or two more then add half a cup of red wine vinegar, half a teaspoon of sugar, a teaspoon of dried oregano, a quarter teaspoon of red pepper flakes and salt to taste. Cook until the vinegar has evaporated and the carrots are starting to sauté in the olive oil. The carrots are great lukewarm or at room temperature. Fennel’s sweet licorice flavor blends beautifully with the sour tartness of lemon, particularly in a simple raw salad of thinly sliced fennel, lemon juice and parsley. I described this salad in a post a few weeks ago and make it a lot: https://lopezislandkitchengardens.wordpress.com/2012/06/29/fennel/. 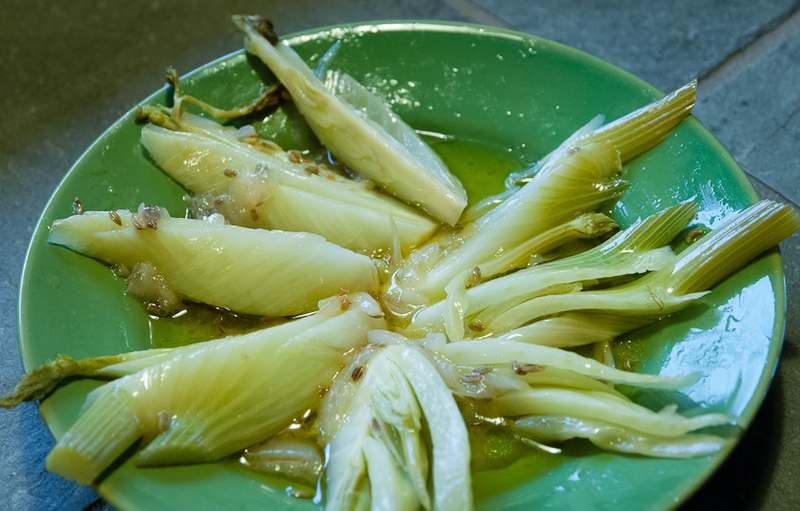 This time, though, I thought I’d try preparing the fennel a la Grecque, a French method borrowed from the Greeks. Unlike Scapece, the Italian method borrowed from the Spanish that calls for frying vegetables in olive oil before steeping them in vinegar and spices, the a la Grecque method calls for poaching vegetables in a mix of olive oil, white wine vinegar, white wine, lemon and spices until they’re tender but still crunchy, then removing them from the poaching liquid, allowing both to cool and then returning the vegetables to the liquid and letting them sit for a few hours before serving. Recipes vary a lot in the proportion of olive oil to wine and wine vinegar, anywhere from two cups of olive oil to two cups of white wine vinegar and three-quarters of a cup of white wine for a pound of fennel in Alice Waters’ Chez Panisse Vegetables to two teaspoons (yes, teaspoons!) of olive oil to a half cup of white wine for a pound of fennel in Deborah Madison’s Vegetarian Cooking for Everyone. Julia Child’s recipe in Mastering the Art of French Cooking, volume I, falls closer to Madison’s with six tablespoons of olive oil to two cups of water (no wine!) and a third of a cup of lemon juice for a pound of fennel. Since I was experimenting, I took a quarter pound fennel bulb and made a quarter of the poaching liquid from the Waters’ recipe. I have to say that I was disappointed by how much the poaching flavors dominated the fennel but I’ll try again, using Madison’s recipe next time or perhaps Julia Child’s. 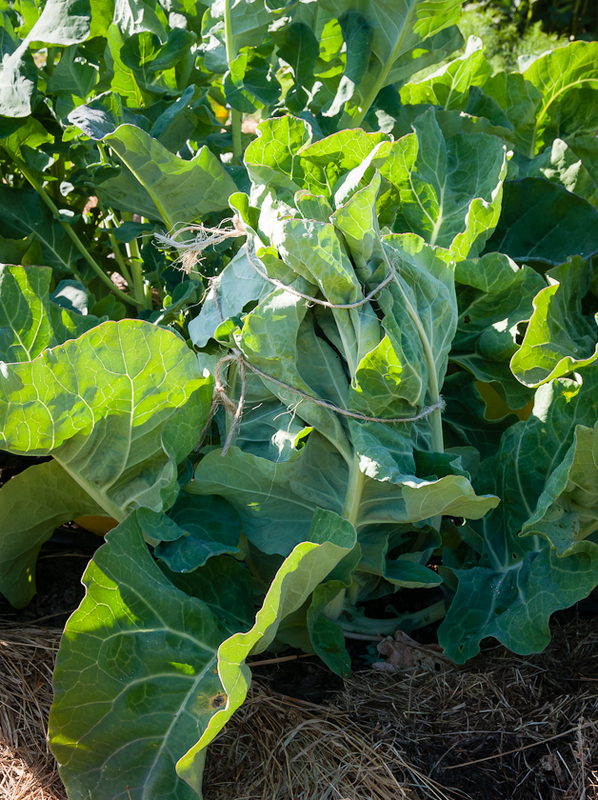 I’ll try other vegetables a la Grecque as well. I’m not making pickles for jars, but I’m really having fun exploring ways to add sour and spice to the sweetness of summer vegetables. 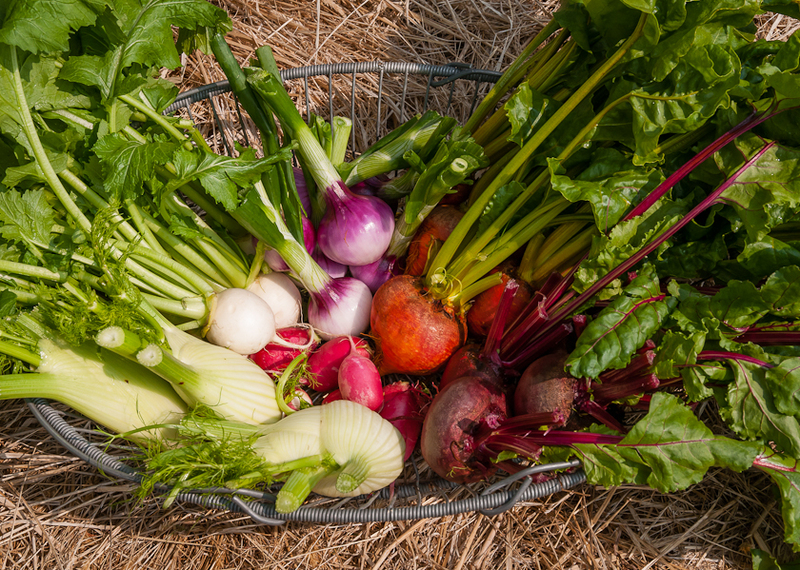 The beets, fennel, turnips, and onions that I planted in April and May are ready to harvest, creating a beautiful still life as I pile them into my garden basket. 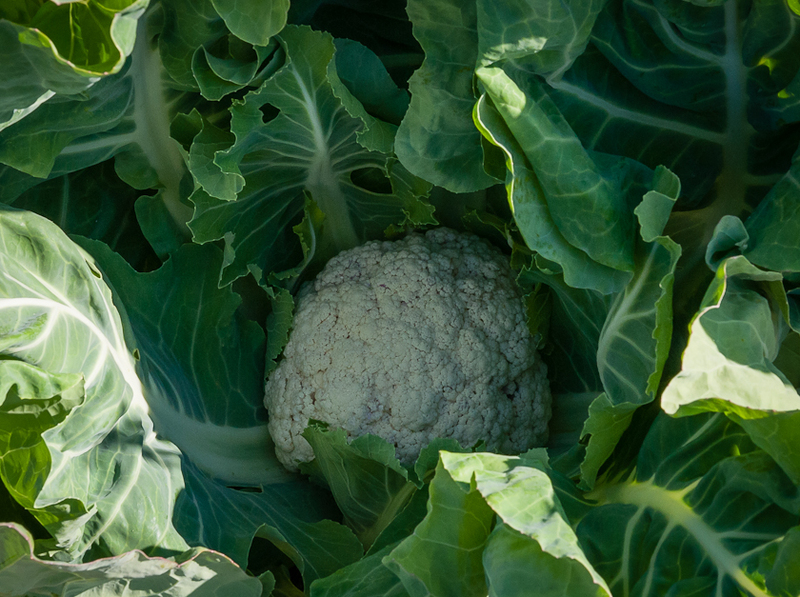 They’d make a great centerpiece, but tempted as I am simply to admire this produce, I’m more tempted to cook it. 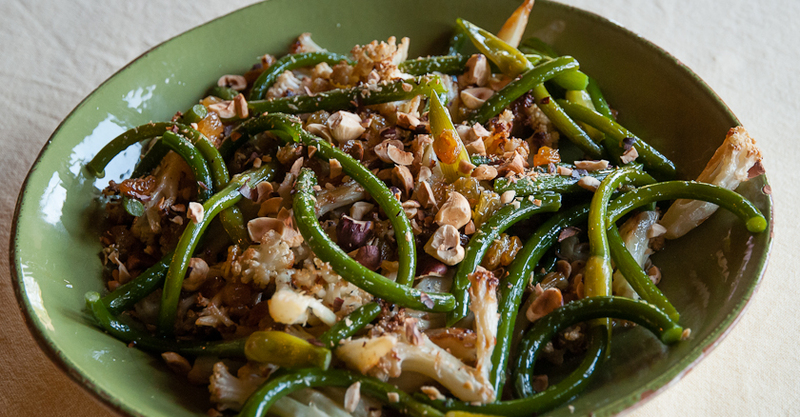 Roasting is a perfect way to enjoy the beauty of these vegetables but eat them too. 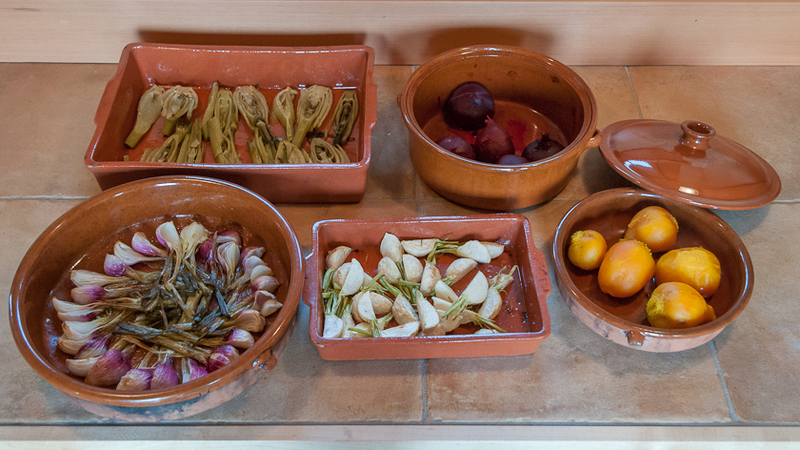 Part of the pleasure of roasting vegetables is arranging them in oven dishes. Over the years, I’ve bought several pieces of clay cookware, mostly from The Spanish Table: http://www.spanishtable.com/mm5/merchant.mvcScreen=CTGY&Store_Code=TST&Category_Code=barro. The round or rectangular shallow dishes called cazuelas and the deeper casseroles called cocotes are sturdy and reasonably priced, go from oven to table and can even be used on a stovetop gas flame. Many also come with lids. 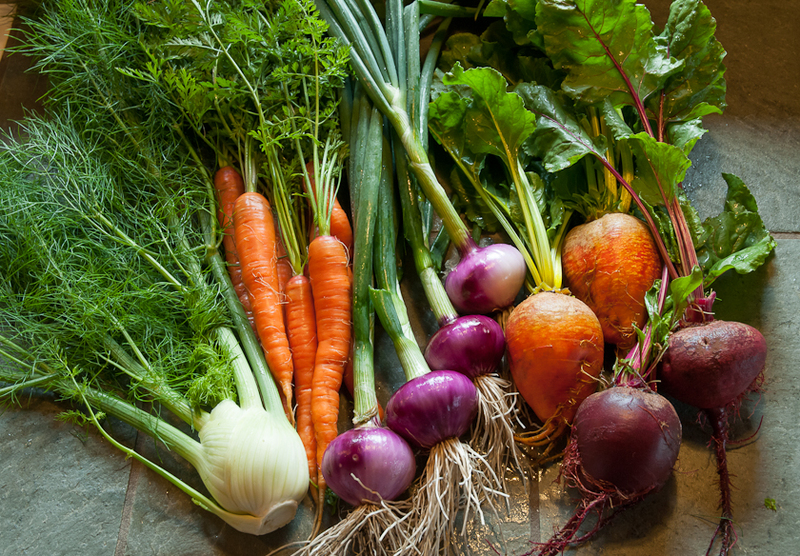 And their pretty terra cotta color is a perfect background for jewel-toned vegetables. Purplette onions halved or quartered make a pretty pinwheel in a shallow round cazuela. 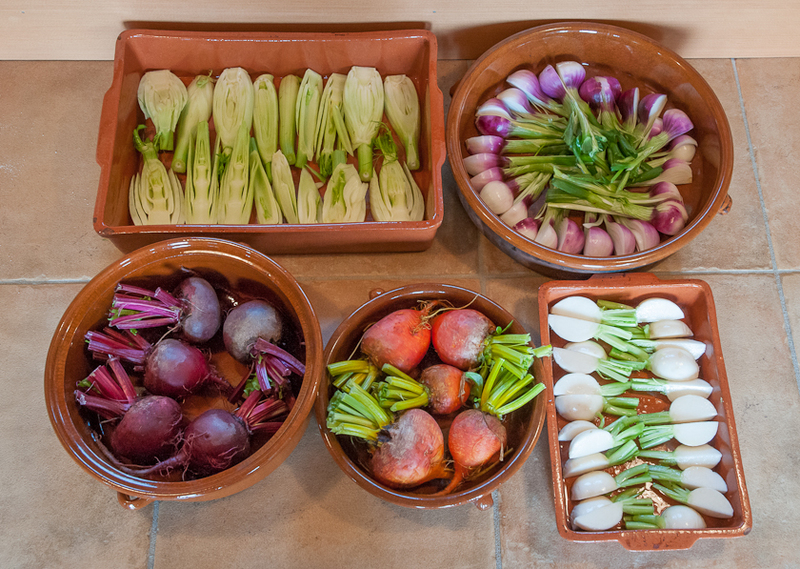 White spring turnips trimmed to leave some green stem then cut in quarters and fennel sliced lengthwise to reveal green and white cross sections both create lovely patterns against rectangular cazuelas. And red and golden beets are gorgeous against the terra cotta. After admiring the onions, turnips and fennel, I brush them lightly with olive oil, sprinkle on a little salt and put them, uncovered, in a hot oven, 425 or so. I usually cover the beets, either with a lid or foil. Sometimes I’ll add a little olive oil to keep the beets from sticking or I’ll add a half-inch of water to the dish so the beets actually steam instead of roasting. The onions, turnips and fennel are caramelized and soft in twenty to thirty minutes and the beets, depending in size, take anywhere from thirty minutes to an hour. Roasting mutes the vibrant tones of raw vegetables, browning the edges and crisping the stems, but the trade-offs are sweet fragrances and the promise of intense flavors. 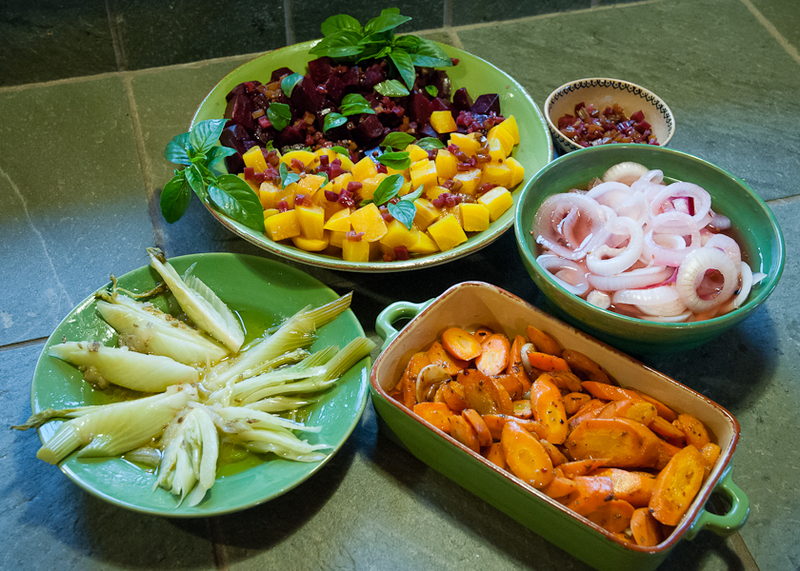 If I’m having a party, I’ll roughly chop the beets, return them to the cazuela and dress them with a little olive oil or vinaigrette and then lay out all these pretty dishes so people can create their own roasted vegetable designs on their plates. If no company’s coming, Scott and I look forward to several days of roasted vegetables arranged in many ways. For this last batch of roasted vegetables, I used some of the beets to make beet hummus, a favorite way to use roasted beets: https://lopezislandkitchengardens.wordpress.com/2011/08/28/beets-red-and-yellow/. We ate the turnips right away. The next night, I tossed the rest of the beets with fresh radicchio and added some of the roasted onions and fennel for a hearty salad and a few days later mixed the remaining fennel and onions with sliced radishes for another salad. 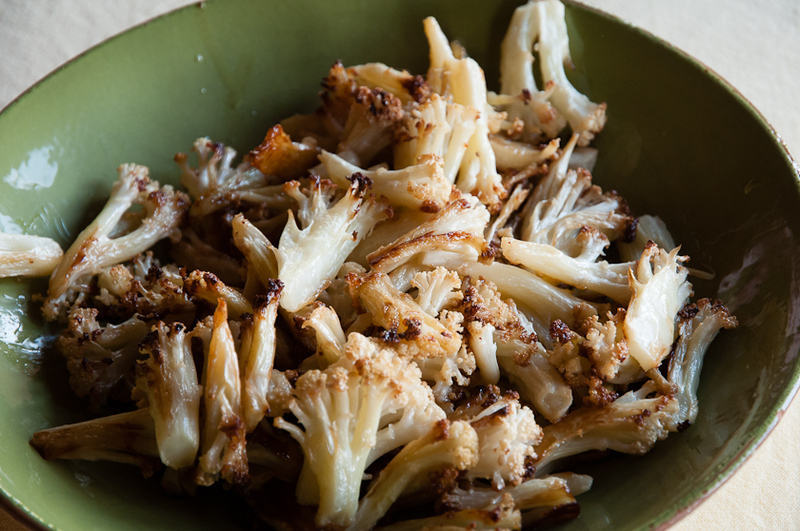 Roasted and soft, raw and crisp, they were all beautiful and delicious celebrations of summer’s bounty.